UGC NET Application Form Correction 2019 – National Testing Agency (NTA) activated the UGC NET Application Form 2019 Correction window on April 08, 2019. The window opened one day late. The candidates can correct their application form at natnet.nic.in. The deadline to make a correction in application form is April 14, 2019. Only one time correction can be made in the online form. Final details reflect in the UGC NET Admit Card. The UGC NET Examination will be conducted on June 20, 21, 24, 25, 26, 27 and 28, 2019. From this page, the candidates will get full information regarding UGC NET Application Form Correction 2019. The candidates can only use online mode for making or editing the correction in the UGC NET Application Form 2019. For more information regarding UGC NET Application Form Correction 2019 check the schedule given below. 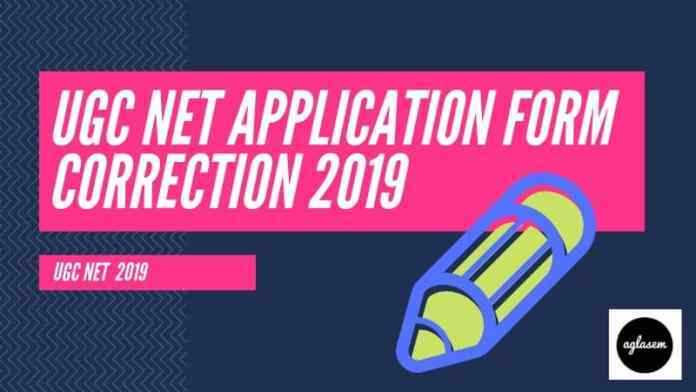 Application Form Correction: Click here to Correct UGC NET Application Form 2019. Give an edge to your UGC NET Preparation! UGC NET is a crucial exam for Masters degree holders. It opens up a plethora of career options. In order to be among the top 6%, you need to work hard and have full focus on your goal. To assist your preparation, AglaSem launches free UGC NET Mock Tests for ALL SUBJECTS. UGC NET Mock Tests, free, by AglaSem – TRY NOW! NTA is charging Fee for making the correction in UGC NET Application Form. The candidates will need to pay a certain amount for doing the correction. Candidates can pay the amount through the credit/debit card or through e-challan generated during the online correction. The amount of fee correction will be shown after submitting the correction. How To Correct UGC NET Application Form 2019? The candidates who have filled the online form on time those will be only allowed to do the UGC NET Application Form Correction 2019. Candidate can follow the given below steps for doing the correction in UGC NET Application Form. Thereafter, the link redirects to the login page. Enter the login details such as Application Number, Password, Security Pin etc on the login page. After filling all the login details click on the login button. Thereafter, the Application Form page will appear which has been already filled by you. From that application form page, you can reread all the mentioned details and can edit or do the corrections of yours mentioned particulars. After doing the correction read the details again then click on the submit button. After editing the UGC NET Application Form page when the applicant will click on the submit button it may be possible that one online form confirmation page display on the screen. Keep it safely until declaration of result of UGC NET. Candidate needs to read all the mentioned details on that page carefully and if the candidate will agree with all the mentioned details on that page then click on the ok button. After confirming the confirmation page candidate’s application form correction will be done successfully and will be submitted automatically. What Changes Are Allowed In UGC NET Application Form 2019? The candidates can do the Changes in all the fields. While making the changes candidates should be careful because once the correction will be submitted it cannot be changed. If the candidates will not do the form correction in the given time frame than the changes in the form cannot be made. Note: Check that your category is correct. UGC NET Cut Off is different for every category. How Many Times Correction Are Allowed In The UGC NET Application Form 2019? NTA will open the correction window for one time. Once the correction in the form has been made and submitted by the candidate then after that candidates will not be able to recorrect or edit details mentioned. After submitting the edited form that form will be considered for the further process and if then to the edited form is containing any false details then those form will be rejected. No more corrections shall be allowed after exam, during answer key issuance, or declaration of result. Reasons That Can Reject Your UGC NET Application Form? If the candidate’s photograph or signature will contain below-mentioned drawback then those application form will be might rejected. Writing name in capital letters instead of signature in running handwriting. Drawing a line or fancy circle rather of a signature. Once the process of the application process will over admit card for the examination will be issued to those candidates who have submitted the form on time. The candidates will be able to download the admit card from ntanet.nic.in. The candidates will have to provide the login credentails to download the admit card. The only mode of getting the admit card is online apart from that no other mode will be provided. It will be mandatory for all the candidates to carry a hard copy of the admit one valid proof on the day of the UGC NET 2019 Examination. Subject chosen in form displays in admit card. You get UGC NET Question Paper of that subject only which you chose. The National Eligibility Test is being conducted by the National Testing Agency on the behalf of University Grant Commission. The Test is being conducted to determine the (CBSE)’s hand But after the formtaion of new Agancy the conduct of big examination handed over to NTA. From December 2018 onwards the NTA is conducting the UGC NET. The postgraduates appear for the examination to avail the Eligibility Certificate as Assistant Professor, JRF. Exam pattern of UGC NET 2019 is same as last time, other than the fact that there is no gap between papers now. Candidates should study all topics given in official UGC NET Syllabus. Ques: Would my form be rejected, if it doesn’t contain the Name and Date of Photograph? Ans: No, NTA will not reject your form, it is not mandatory to mention Name & Date in Photograph. Ques: I have updated my signature with blue ink instead of black ink in UGC NET 2019 Form, will it affect my form? Ans: No there will not be any effect on your application form for the merely mistake. Ques: In case my another State Eligibility Test clashes with the UGC NET 2019 examination, what should I do, will NTA change my exam date? Ans: Well it depends on NTA, NTA may change your exam date as per the availability of exam dates. But the candidate should send a proper mail to the NTA for resolving this issue. Ques: What I should do to change the medium for examination, I have chosen the English as the medium of examination, but wants to appear in Hindi? Ans: No worries, at the time of CBT you can choose the languge of question paper?